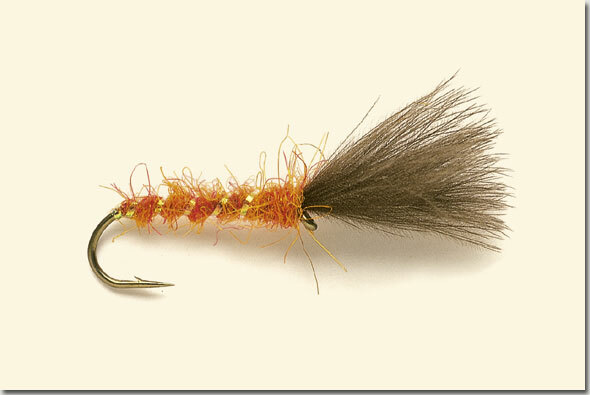 With its novel construction, the Shuttlecock epitomises the use of cul-de-canard in modern stillwater trout flies. By combining a slim, quicksinking abdomen with a dense plume of natural CDC the pattern imitates brilliantly the chironomid midge pupa as it transposes into the winged adult. 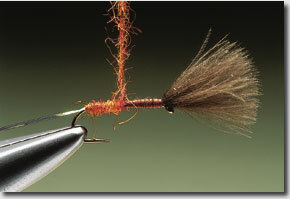 Although other patterns such as the Suspender Buzzer, are designed to imitate this critical stage in the chironomid’s lifecycle few are as quick and easy to tie and, what’s more important, as effective as the Shuttlecock. It can be tied in a combination of sizes and colours to match those of the prevailing hatch, though the most effective colours are orange, black, fiery brown and olive. The key to the pattern’s success is the CDC wing. This keeps the fly sitting in the surface film while the slim body sinks beneath to imitate the profile of a hatching midge. The pearl tinsel rib adds that finishing touch, providing a sparkle typically found in the body of a fully developed midge pupa. 1. 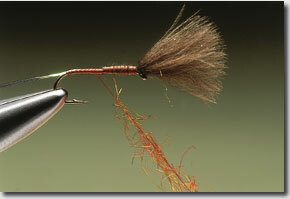 Fix the hook securely in the vice before running on the tying thread at the eye. 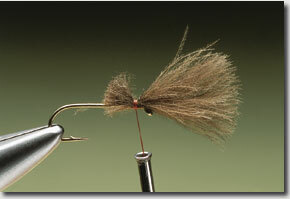 Wind the thread a short distance down the shank, in close turns, to form a base for the wing. 2. Select a natural grey cul-de-canard feather. Choose one that has nice fluffy fibres and where the stem close to the tip is fine and flexible. 3. Find another two similar CDC feathers and place all three together so that their tips are level. Trim away the base material to leave a dense plume and catch it in just behind the eye. 4. Fix the CDC in place with tight thread turns before covering the waste ends with further close turns of thread. Carry the thread down to the bend and catch in two inches of fine pearl tinsel. 5. Secure the waste end of the tinsel along the hook shank. Take a good pinch of orange seal’s fur or substitute and apply it lightly to the thread. 6. Using a simple twisting motion, dub the seal’s fur on to the tying thread to form a thin rope. Starting at the bend, wind the dubbed fur along the shank in close turns. 7. Carry the dubbed fur rope towards the eye until it is a short distance from the wing base. Take hold of the pearl tinsel and wind on five evenly spaced turns. 8. Secure the loose end of the tinsel with tying thread and remove the excess. Take another smaller pinch of fur, dub it on to the thread and wind it to form a small thorax. 9. Take the thread underneath the wing and wind on a few turns right at the eye. Complete by casting off the tying thread with a secure five-turn whip finish. The Shuttlecock is intended to represent a hatching midge and is a great pattern to try when trout are feeding on the naturals on lakes and reservoirs. It is especially effective when fish are preoccupied with the stage when the adult is just emerging from its pupal shuck. During the summer months when trout are feeding close to the surface. May to early July provides the best period, as it is when trout feed most heavily on hatching midge. An olive version also works well when trout are feeding on floating snail. 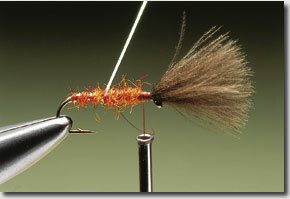 In a light ripple the Shuttlecock can be fished on a floating line as part of a team of dry-flies or combined with a sinking nymph. In calm conditions it works best fished singly on a long and light leader. Ensure that the CDC plumes used are nice and soft with plenty of filaments to grab the water’s surface.